Let children play. Let them solve problems. Let them learn from mistakes. Let them own discoveries. Let play count! Eight little hands covered in drippy, droppy, messiness....in your house....with 15 ft of carpet between them and the bathroom. Add to this picture six more children engaged in various play, needing your attention at random moments. No. This is not a nightmare. This is reality. It is a reality that I didn't think I would ever be able to fully embrace. To say that the thought of messy play made my skin crawl is an understatement. Not only was it sensory overload for me, but it was also patience overkill as well. I was a family child care provider for 16 years. I provided care for up to 12 children at a time, ages 2-6. I provided this care with three co-workers: me, myself and I. I could not wrap my brain around the logistics of offering messy play opportunities when there was just me, myself and I to deal with the side effects of said messy play. What side effects was I concerned about? The mess getting on my carpet. The mess getting on the children's clothing. The mess getting on me. The mess getting on a child who did not want the mess on them and the unknown behaviors such a catastrophe might spark. The inevitable cleaning up of the mess. The thought of what the little people in my care would be doing while me, myself and I cleaned up the messy play residue. Add to these concerns the simple fact that me, myself and I were not fans of cleaning and you can clearly see why I suffered from messyplay-intolerance. 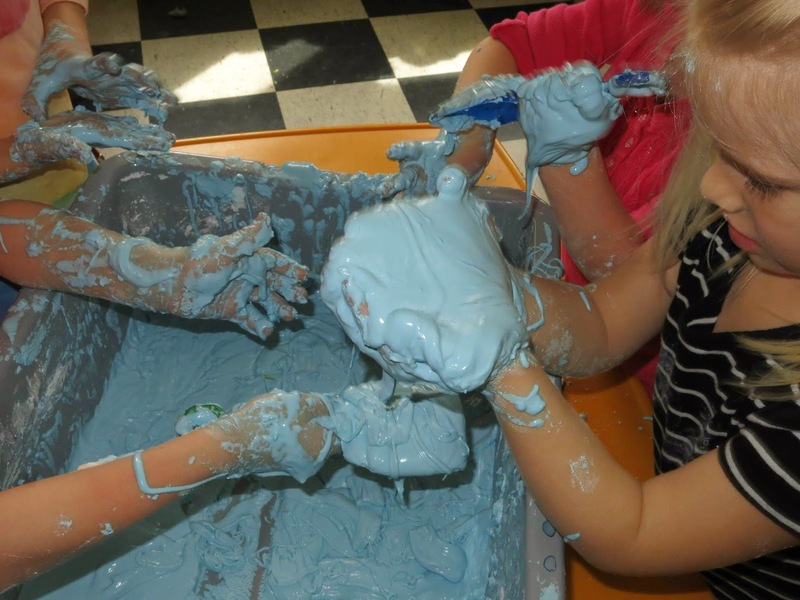 The only messy play I had been able to embrace at this point in my career was playdough, flubber (borax and glue...kind of like silly putty) and ON SPECIAL OCCASIONS ONLY: shaving cream and goop (cornstarch and water). "ON SPECIAL OCCASIONS ONLY" meaning only on days when I had an extreme amount of tolerance and patience. And I mean EXTREME. On the Monday immediately after hearing Lisa's message, I offered messy to my littles. I went for the big dog on this first attempt at embracing play: shaving cream and glue. The sensation of this stuff was amazing. My littles were beyond themselves with excitement. One child literally shook as she squeezed the concoction and loudly exclaimed "I LOVE YOU NITA!!!" Ahhhh yes......Lisa was right. 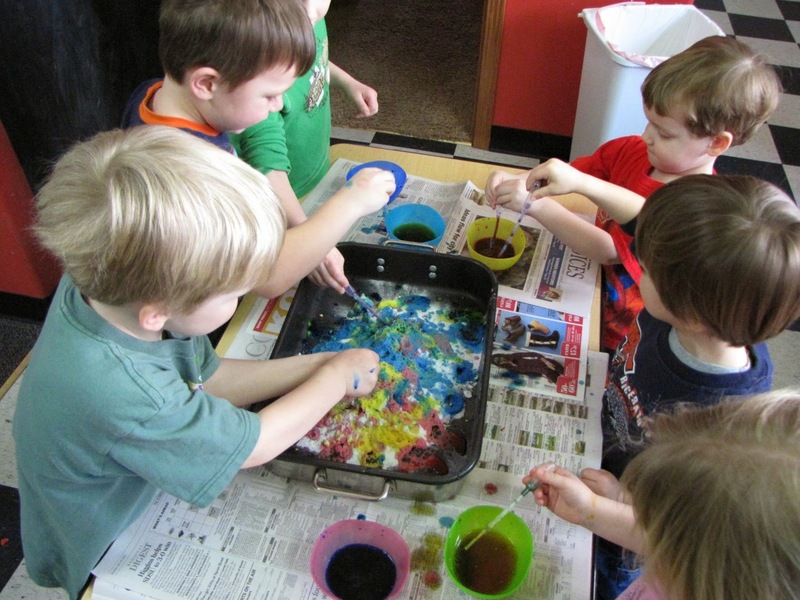 Children NEEDED messy play. They needed to explore with all of their senses the amazing textures of our world. They needed the freedom messy play supplies and the fenceless opportunity for imaginations to wander and soar. It did not take long for story lines to form, the process of figuring out the social rules of messy play and amazing vocabulary to emerge through the child-led play. I stood on the sidelines....prepared to catch that child who was done being messy and quickly and carefully whisk them away to the bathroom so I could wash them up and return them to their mess-free self. I will admit I was on edge. But I kept breathing. Deep....deeeeep....deeeeeeeeeeeep breaths. I kept reminding myself this is good...this is good...this is good. 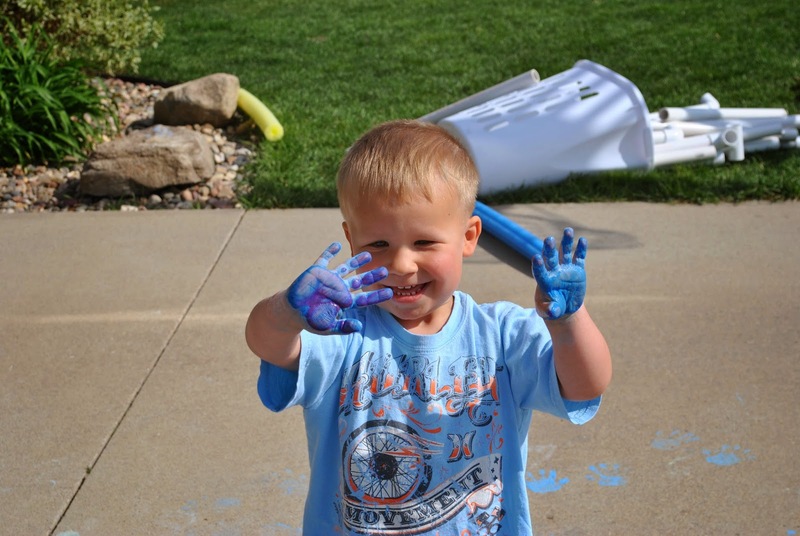 Over the course of time, I learned to embrace messy play, and I learned some tips that I feel may be helpful to other messy-intolerant early childhood professionals out there. 2. Structure the environment. The better job you do at structuring the environment, the more free your little people can be with their play. Set them up for success. Structuring the environment lets children be in control of the experience. It lets them be the organizers of themselves and it sets them up for empowering success! See the structure in this picture? 3. Give ownership to children. Find a way for your littles to be able to own the entire messy experience from start to finish...including the clean up part. Giving ownership of the entire process to young children is not only very empowering for them, but it also takes the stress of "how am I going to clean up all of these mess-covered children?????!!!!" from you...because, you are not going to clean up all of these mess-covered children when they are perfectly capable of doing it themselves. This messy-play opportunity was inspired by the book I Ain't Gonna Paint No More by David Carrow. Notice the structure of the environment, most importantly, the cleaning station in the background, not far from the mess-making area. Give children the tools they need for independence and watch their self esteems and sense of self soar! From messy-to clean...all owned by children. I am proud to say that I did not wash off a single child. My littles, ages 2-6 owned the entire experience...from messy to clean! They left just enough residue in strange places (mainly arm pits) to send the message that they got to do something pretty awesome that day! Children thrive on trust. They love to be trusted. This child was empowered through my trust and he loved getting to own the responsibility of cleaning the bucket we used for messy play on this particular day. 4. Do not force. All children, just as all adults, do not enjoy messy play. Do not force a child to "just touch it, I know you will like it" (please tell me I am not the only one who has done this!!). I have done that. It has back fired almost every single time. Allow children to explore as they are comfortable. TRUST THEM. Be patient and let the natural process of curiosity happen. 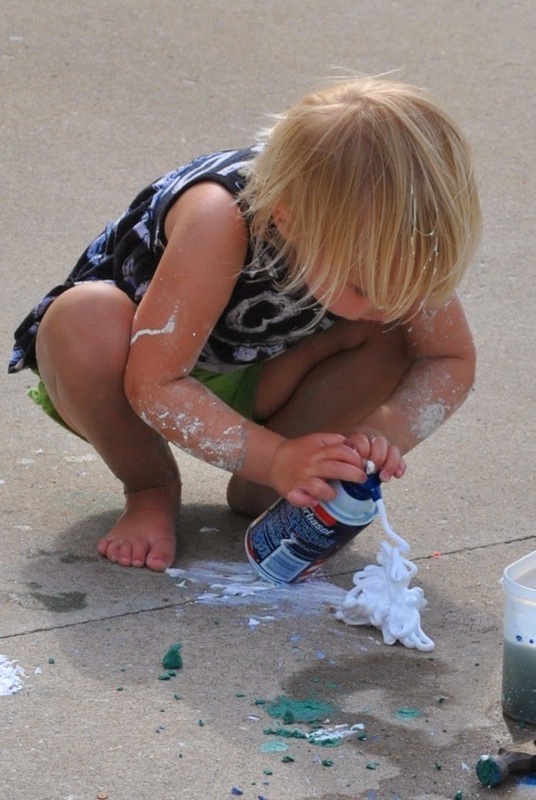 Make sure to have tools available so the messy isn't as threatening, and give lots of time for a young child to learn to trust the messy opportunity. Always supply tools for messy play. 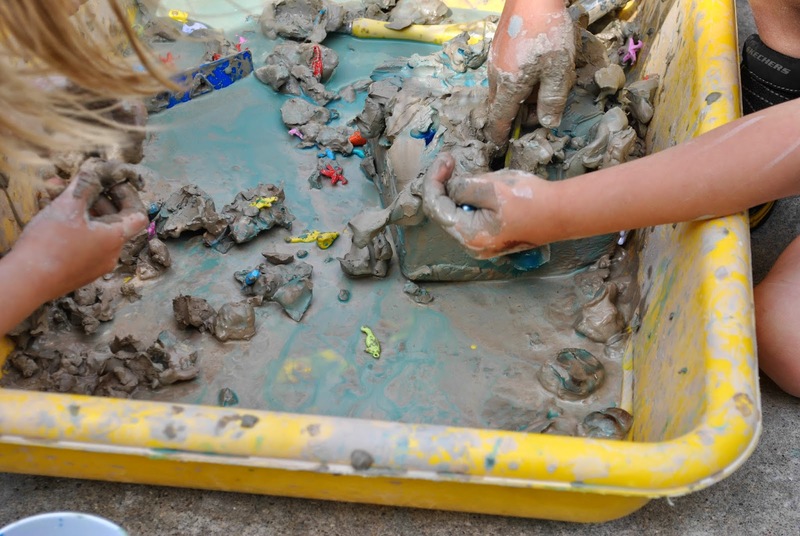 This natural clay was plopped with plenty of tools so children who did not want to get messy could still play. Notice every one's hands? Pretty clean...this was at the beginning of the play. Now scroll to the next picture. The freedom of time is of utmost importance for messy play. 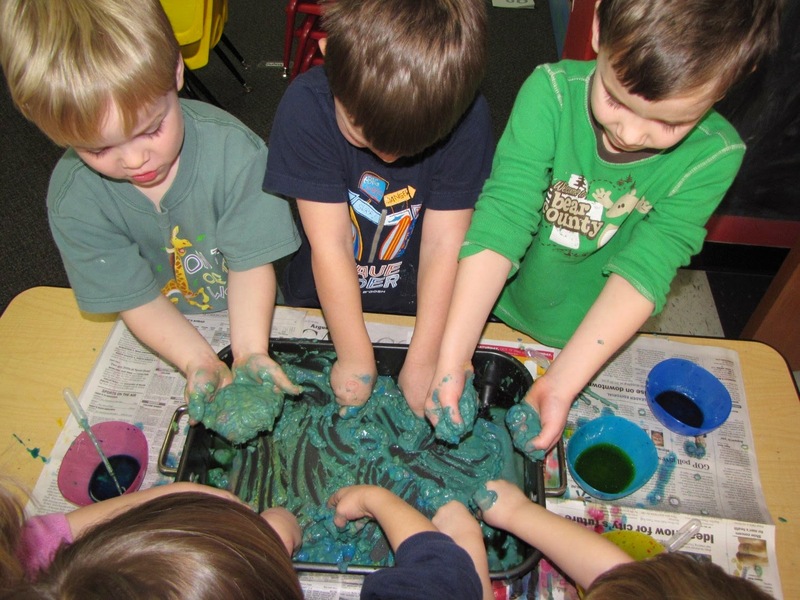 Children need time to warm up to the sensations of new messy play opportunities! 5. It's okay to claim it. It is okay for a child to hog the messy experience and declare that they will be there until pick up time. First of all, that's a huge pat on the back to you. You have offered an opportunity that this child clearly LOVES. Second of all, there are a lot of social lessons involved in that simple declaration of commitment: 1) The child declaring their loyalty to the messy play that day learns that you respect them. They also get an opportunity to be responsible and considerate when they remember to tell the next child that it is their turn (in the event that the messy-loving child over estimated how much they love the messy play and finish before pick up time) 2) the child that is waiting their turn gets an opportunity to practice patience, and the experience of disappointment and delay of gratification. It's a win/win for everyone. Inspired by frozen, colored vinegar on top of baking soda, "Scoopy Doop" was a spontaneous random concoction created out of "I wonder..." moments. The frozen vinegar on baking soda did absolutely nothing. My littles watched it with eyes full of anticipation. It was a genius moment of delayed gratification. After a child wondered what would happen if we squirted warm water on the vinegar cubes, one thing led into another. "I wonder what would happen if we added more vinegar?" "I wonder what would happen if we added more baking soda?" Pretty soon, all of those "I wonders.." led to an amazing concoction!! 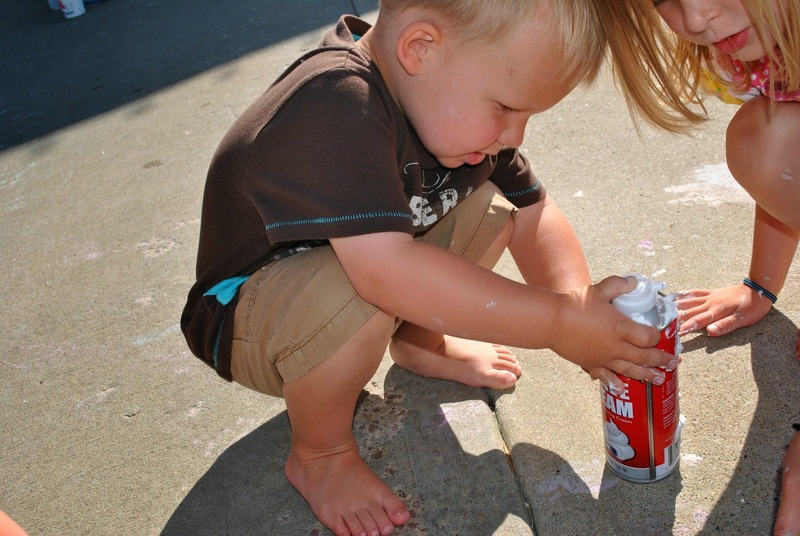 Rather then throw away those itty bits of sidewalk chalk. Soak them and plop them with potato mashers. Little people will know what to do!! 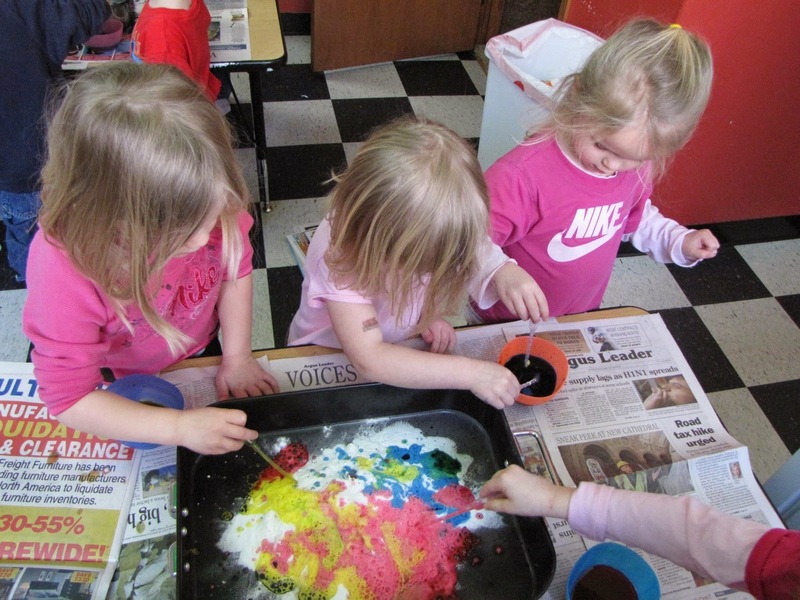 When given the freedom of time, baking soda and colored vinegar can become a fabulous messy play opportunity! 4. Set the Shaving Cream FREE!! The first time I set out the actual bottles of shaving cream, my littles picked it up and handed it to me, telling me I dropped it. I quickly corrected them and said, "No, I set this down for you to play with" They thought they had died and gone to heaven!! THE ENTIRE CAN?! FOR THEM?! Oh the many ways our muscles work! 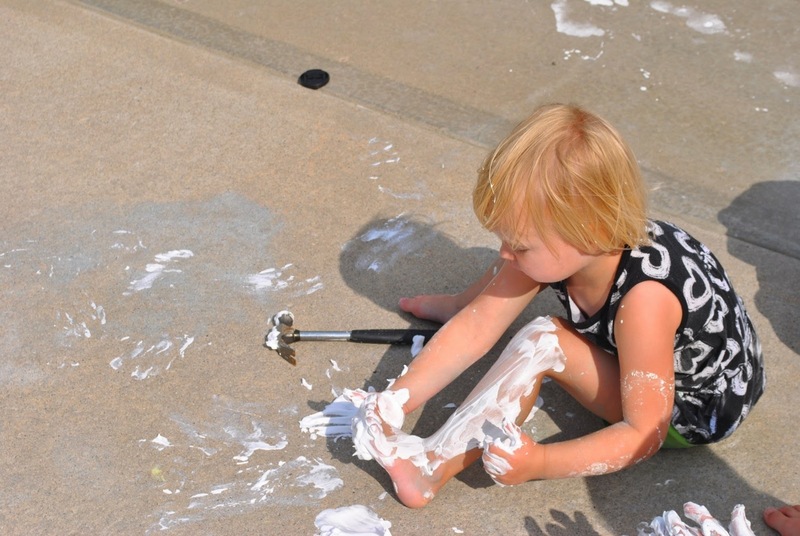 Setting the shaving cream free is an awesome opportunity for young children to learn the many different ways their muscles need to work together in order to accomplish tasks. There was a lot of shoulder shaking going on, with zero success. This child had not yet figured out how to use the muscles in his thumb. After lots of failed attempts and shaking shoulders and arms, this child FINALLY discovered a method that worked! Hmmm...been watching mom shave her legs lately? Children NEED play to make sense of their world, to try the things they see and express themselves!! Not messiest of mess-making play, but it's a grand one none-the-less. Simply mix flour and baby oil until you reach a consistency of moon dough. Once all the flour is saturated with oil, add liquid water color one color at a time, and mix. The colors will form sprinkles, and the different colors will NEVER mix! This is a favorite for ice cream shop play! Yep. It's that simple. Plop a bucket of water, add some cheap shampoo and watch the messy (ha..it's soap!!) fun take over! 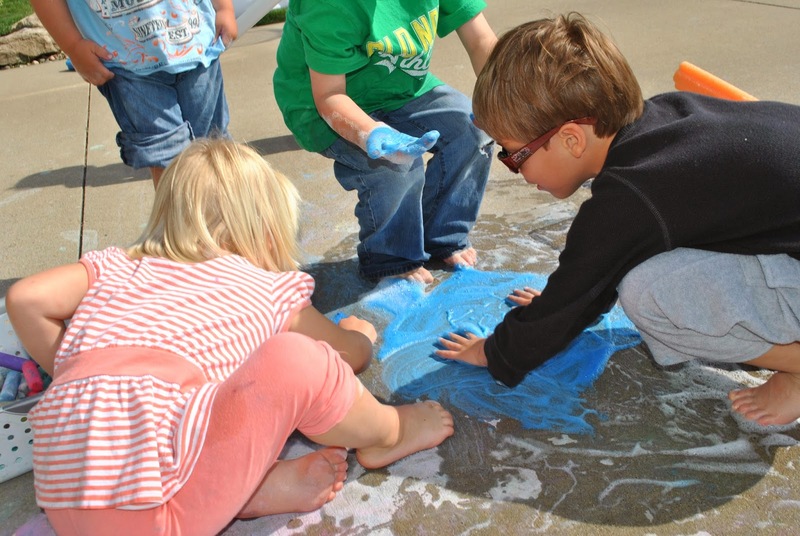 After lots of fun playing with suds, my crew added sidewalk chalk to the suds they were making on the sidewalk. Okay, ye messy-intolerant ones....how are you doing? Was this post successful in giving you some tools in order for you to go forth and embrace messy play? Take a deep breath in....read this blog several more times....and go get messy!! Interested in having Denita speak at your next early childhood educator training? Contact her at steelerfan.dd@gmail.com. For whatever reason...adults (well intentioned adults, mind you) feel that young children need to learn in themes. They feel the brains of a young child are actually organized enough to see the world thematically, and not only that, but desire staying with the same theme for sometimes weeks at a time. For whatever reason...adults (still well intentioned adults) feel that everything a young child learns while in a preschool type program should be all bundled up nice and neat in the form of a theme. Whether this is to appease misinformed parents, inspire bulletin boards or help children with their life long skill of categorizing, themes have ruled the preschool world for years. For whatever reason....adults (and yes, still well intentioned adults) work tirelessly after hours to bring a theme alive for young children. I stapled (yes, you read correctly) roughly fifty greeny vines to the ceiling of my basement to replicate a jungle for our jungle theme years and years ago. HEAR me now...if you can't bring children to the jungle, a teacher-led jungle theme is not an effective way to give children an opportunity for MEANINGFUL learning. These same well intentioned adults choose their themes wisely, taking into consideration the interests of each child in their program...and therefore, they call their program "child-led". This is not what child-led means. Child-led means the children are the curriculum. Child-led means the adult carefully observes the children in their program and follows their lead and enhances the discoveries owned by young children. I lived and breathed for themes. I dare say I was a self-declared "Queen of Themes". In fact, if you look back at my very first blog posts, you will see the remains of my themey self. An innocent caterpillar that did not fit into my grand theme...but would in two weeks when I had "Caterpillars" in the lesson plans. A caterpillar, that I was not going to bring inside so young children could observe and learn from, simply because he did not fit into my adult-led theme. What was this theme that was so much better then watching a child-discovered caterpillar metamorphosize into a butterfly? After much chit chat with myself, I went back to my crew, and said I made a mistake. We brought the caterpillar inside and this particular moment will always be known as my biggest and most beneficial "aha moment". And so began the metamorphosis of my program. From that day forward, little by little I gave up on my "themey" ways. What did I discover as I let go of themes, step by step? I discovered a child's brain does NOT work in themes. Well, I take that back...a child's brain does not stay on one theme for very long, and certainly not in synchronization with all the other brains in the room. I might have ONE child interested in dinosaurs for weeks, another that shows interest for five minutes here and five minutes there, but nothing consistent. I might have 4 children who are enjoying a picnic lunch..when suddenly, as often does in child led play...one thing leads to another and the dinosaur lover, in his dinosaur ways has come to destroy said picnic....and the picnickers play along for a few minutes until a bright shiny object catches their eye and they are off to another topic...perhaps even splitting into twos as the world of curiosity beckons each child in unique ways. I discovered that I could still get my theme-fix during the holidays. I learned to "set some bait" so to speak. If the bait didn't inspire the direction of the traditional theme, I learned that was okay, and I could ditch the theme and follow what the current interests of my littles were. For example: after Thanksgiving, teensy gingerbread boys just start appearing. First one. Then two. Then three. This particular bait is always taken and leads into our tradition of gingerbread boy fun. BUT, if they were to not "take the bait" I would be okay with it (well..truth be told, I would sort of be okay with it ... I'm not perfect after all!!!). I discovered that all the time I took to organize my supplies and books into themes over the years was still helpful because when children are allowed to lead, we sometimes visit up to 5 different themes in a given day. It just depends on the interests of each individual child. Organization is the KEY to following young children. I need to know where my stuff is at a moments notice! I discovered that I should not be feeling guilty that I was no longer sending home theme-related notes and having theme-related show and tell opportunities and theme-related snacks. I discovered that if I continued to do that, it was not to benefit the children...it would instead be all about pleasing the parents. I discovered my job is to educate parents, not to please parents. My job is to create an environment that allows young children to learn in the way they were wired to learn. Research proves young children learn best through child-led explorations and play. My job is to provide a learning experience that benefits the children. My job is to then educate the parents the reasoning behind why I do my job the way I do it. I discovered that my job is to educate parents, not to please parents. A child-led program looks much different then a teacher-led/controlled one does. Changing from teacher-led to child-led can come across as the teacher is "not doing their job as well as they did before". Do not assume your parents "get it". Do not assume your parents are reading your blog or other information you send home. Assume that you cannot educate too much. You cannot show them too much research or too many articles that support play based and child-led programs. You cannot talk to them too much about how their child is learning. Take a deep breath. Reflect. I know from personal experience, change is hard. I also know from personal experiencing that recognizing the need for change is harder....sometimes it takes several, slap ya in the face, "aha moments" to alter your perspective and open your eyes. Caterpillars make change look so easy and effortless, when in all actuality it is challenging and somewhat painful. Are the rewards worth the effort? The change this post suggests gives children the wings they were wired to use. Following young children and trusting them as learners gives each child the freedom to soar at their own pace to heights unique to them. Welcome to Play Counts! My name is Denita Dinger. I have enjoyed the honor of being a family child care/preschool teacher for 16 years. I am just beginning a new venture as a play school teacher (I waved goodbye to my all-day program in May of 2014). After gradually transitioning my program from teacher-led to child-led, I can say, without doubt that play truly is the "important stuff". I love to share my journey with others who also feel the need to slow down the pushing of academics and make positive changes to their early childhood program. I am proud to call myself a defender of play, and sincerely hope you find inspiration here and choose to join me on my mission to help others see the value of play! Are We Cutting in Line?